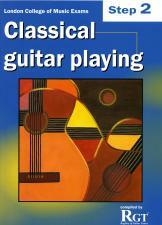 Ideal for those who have fairly recently begun to play classical guitar, this is the second of a progressive series of ten handbooks primarily intended for candidates considering taking the London College of Music examinations in classical guitar playing. This handbook covers all the material needed for the Step Two examination and, as well as fingerboard knowledge and musical knowledge sections, it includes pieces by Vivaldi, Bach, Mozart, Rossini and others. Even if you do not intend to take an examination, the handbook provides a structured and comprehensive resource for studying the classical guitar, helping you to develop all aspects of your playing and extend your musical repertoire with pieces from a wide range of styles and periods.